First, despite all of the hype, vaccines have repeatedly proven to be the single best method of avoiding coming down with the flu. Those are the facts. In 1890, one out of every five American children died before their first birthday. Another one out of five children died before their fifth birthday and not only poor children. Everyone knew children who had died of measles, mumps, rubella, polio, or whooping cough. If you don’t believe this stop in an old cemetery sometime and read the headstones. You will see that far more children died young than today, little headstones with lambs and angels that we almost never see today. Today, largely because of vaccination, those diseases barely exist, and many of the internet posters and anti-virus agitators do not remember these epidemics that once carried off hundreds of thousands of men, women, and children each year. 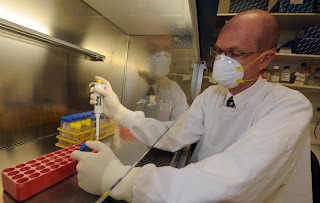 The following is an effort to put the best official sources of information about the Swine Flu vaccine from the Centers For Disease Control and World Health Organization into simple easy to understand language. For the full information refer to those sites. A 2009 H1N1 “flu shot” — an inactivated vaccine (containing dead virus) is given with a needle, usually in the arm. The flu shot is approved for use in people 6 months of age and older, including healthy people, people with chronic medical conditions and pregnant women. The 2009 H1N1 nasal spray flu vaccine — a vaccine made with live, weakened viruses that do not cause the flu (sometimes called LAIV for “live attenuated influenza vaccine”). Nasal vaccine is approved for use in “healthy” people 2 years to 49 years of age who are not pregnant. About 2 weeks after vaccination, antibodies that provide protection against 2009 H1N1 influenza virus infection will develop in the body. However, the 2009 H1N1 vaccine will not protect against seasonal influenza viruses, so to get the best possible protection you will need two flu shots. People 25 years through 64 years of age who have certain illnesses. People who developed Guillain-Barré syndrome (GBS) within 6 weeks of getting an influenza vaccine previously. The ability of a flu vaccine to protect a person depends on the age and health status of the person getting the vaccine, and the similarity or “match” between the viruses or virus in the vaccine and those in circulation. The same side effects typically associated with the seasonal flu shot and the seasonal nasal spray vaccine are expected with the 2009 H1N1 flu shot and 2009 H1N1 nasal spray vaccine. If these problems occur, they begin soon after the shot, are usually mild, and usually last 1 to 2 days. Almost all people who receive influenza vaccine have no serious problems from it. However, on rare occasions, flu vaccination can cause serious problems, such as severe allergic reactions.